What on Earth Are Poms??? Do you hear other academic writers asking questions like this? Do they confuse you entirely? You are not alone! Why do we in Academic Ladder like Poms? 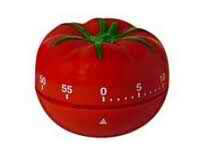 Academic writers all over the world are adopting The Pomodoro Technique® and you hear about it in our Academic Writing Clubs and outside them. Our Academic Ladder Newsletter featured them in September 13, 2006 article: Academic Writing: Use a Timer to Make Yourself Write and the Pomodoro Technique® web page also includes a book to download for free. You know we love timers in Academic Ladder! We know, from hundreds of academic writers and from the research, that writing in brief, regular sessions generally results in writing more, with less stress. We also know that those sessions are more reliably successful when they have both a minimum time and a maximum time. Minimum time we understand. We can tolerate even painful writing for 15 minutes. But for many of us, maximum time matters too. It is important, says Robert Boice’s research, to stop writing before you feel ready, so you stop while still engaged. The step to Poms is natural for many of us. Francesco Cirillo developed The Pomodoro Technique® as a productivity strategy for workers in an office, not primarily for writers. It is built around work units of 25 minutes separated by 5 minute breaks. After four such sessions (two hours,) you take a longer break. Read the rest of the article: What on Earth Are Poms?? ?